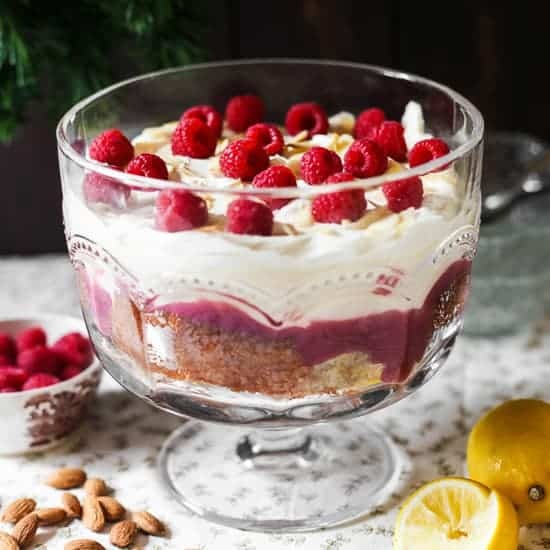 This Lemon, Almond and Raspberry Trifle is a perfectly special way to end your winter feast. A gluten-free lemon and almond sponge is drizzled with limoncello, cosseted by a thick blanket of raspberry curd and topped with dreamy lemon custard and clouds of double cream. A crunch of toasted almonds and fresh raspberries are scattered to finish. This year for the first year I am not hosting Christmas. I am not pre-ordering a turkey, stockpiling crackers or heaving the Christmas crockery down from the attic. Instead we are spending Christmas at my sister’s with her partner and my brand new niece. Cole has yet to meet his tiny baby cousin and we just can’t wait to get them together. It’s going to be a totally different Christmas for me as usually whilst everyone is chilling out with glasses of buck fizz, nibbling on nuts and chocolate and playing pre-lunchtime games, I am in a merry haze in the kitchen juggling brussel sprouts, frantically whisking gravies and wedging the pigs in blankets into an oven bursting at the seams. My sister has only made two food-related requests of me this year, that I bring the Christmas pudding and The Trifle. I am not taking my duties lightly either as these two dessert options are non-negotiable in our family. Christmas might as well be cancelled if neither are produced at the end of our midday banquet. No matter that none of us are able to manage one more mouthful after the full on turkey feast let alone a bowlful of two incredibly rich desserts. We struggle on nevertheless and more often than not leap in for seconds. There is enough of both desserts to feed twenty families and by December 27th you can usually find me face deep inside the fridge digging out inroads of leftover trifle on a teaspoon (the diet spoon). It is imperative to gather enough sponge, fruit, custard and cream for each bite, the teaspoon makes it a challenge but I assure you it is possible. Every year I tweak my trifle recipe depending on which fruit I am fancying. But this year for extra fun I have also adapted my trifle recipe to be gluten-free. I created a delicious almond sponge for Cole’s first birthday back in June and this has proved to be the perfect base for the trifle. It is a lovely sturdy sponge which it important as it has to soak up rather a lot of limoncello without dissolving into a pile of sog. I have also taken inspiration from Nigel Slater’s Lemon Trifle from his Kitchen Diaries cookbook as my love for his recipe knows no bounds. I have mercilessly cribbed the bits I love best from it, namely the use of limoncello as the alcohol soak for the bottom layer of sponge and his idea of a fruit curd for the fruit base. He uses lemon, but here I have used a very easy homemade raspberry curd. Then I copied directly his no-egg lemon custard, which is made from only double cream, caster sugar and lemon juice, to ladle on top of the curd. At this point you leave the trifle to rest overnight and the custard sets like a dream. I usually take the recipe to this stage on Christmas Eve (or even the 23rd if there is room in the fridge to store) and then whip up the double cream for spooning on top of the whole affair just before serving on Christmas Day. It is a magnificent way to end the most indulgent meal of the year and in our family Christmas would not be the same without it. We also cannot possibly forget the tradition of exclaiming after the first mouthful how much this year’s trifle is the best one ever. There is no way that my Lemon, Almond and Raspberry Trifle will disappoint us. Pre-heat the oven to 160°C and line and grease a 7 inch square cake tin. Beat the sugar with the butter and lemon zest until light and fluffy. In a separate bowl whisk together the flour, almonds, baking powder and salt then beat into the rest of the ingredients. Bake for 30 minutes, then remove from the oven and cool on a wire rack for about four hours. Once cool, cut circles out of the sponge which are easier to assemble into the bottom of the trifle bowl. When your sponge is in place then spoon over the limoncello. Heat the raspberries in a medium saucepan with a small splash of water until the raspberries have completely softened. Strain, keeping the juice for the curd. In a medium saucepan combine the strained raspberry juice, raspberry powder, lemon juice, caster sugar and butter and whisk them together whilst bringing to a low boil. Remove from the heat then pour a splash of the raspberry into the beaten eggs and whisk well, pour a little bit more of the raspberry in and continue whisking, then continue pouring the raspberry liquid into the eggs in a slow stream until combined. Pour it all back into the saucepan and bring to a boil, still whisking all the time, then continue whisking for 5 minutes until the mixture thickens. Remove from the heat and strain so the curd is very smooth. Place the curd in the fridge for an hour to cool. Once the curd has cooled then spoon over the limoncello soaked sponge in an even layer. Pour the double cream and the sugar into a medium saucepan and bring to a gentle boil, allowing to simmer for a couple of minutes. Remove the cream from the heat and stir in the lemon juice. Pour the lemon custard over the raspberry curd and place in the fridge, this time to rest overnight so the custard can set. Whip the double cream until thick then spoon over the top of the trifle. Decorate with toasted almonds and fresh raspberries. The raspberry powder is completely optional. It does amp up the raspberry taste but the main reason for using is to improve the colour otherwise the curd can look a little grey.